Positive Aspects community · Created a new topic Does it work with sub-windows? Yes! Currently only windows with a border and caption/title bar will be resized correctly; borderless windows can still be resized but won't have the exact aspect ratio or resolution indicated. I may come back and add support for this later when I have time, or if it is commonly requested. Positive Aspects is provided completely free of charge with the understanding that I cannot be held liable for any decisions made as a result of using this program, or any issues caused by using this program, even if the program was at fault. Do please report any issues though! This program was built using AutoHotKey v1.1.28, which is a comprehensive scripting wrapper around the Windows API. It will therefore probably run on Windows XP or above, though I've only tested on Windows 10. This also means it is very much a Windows exclusive; comparable programs can probably be made for Mac and Linux but I have no intention of doing so any time soon. Feel free to link to other programs that do something similar for whatever operating system. By the time I was done making it my face hurt from laughing, good to hear other people found it funny too! Simple and very effective, nice work! Really cool mechanic, super difficult to wrap your head around. Nice execution of an interesting mechanic. I haven't seen something quite like this before! Wow, day 6 was crazy! It was the final day of the jam so I've put up a version of the game you can play right here, but I think I'll probably be doing some more with this post-jam. Right now though I'm very tired. 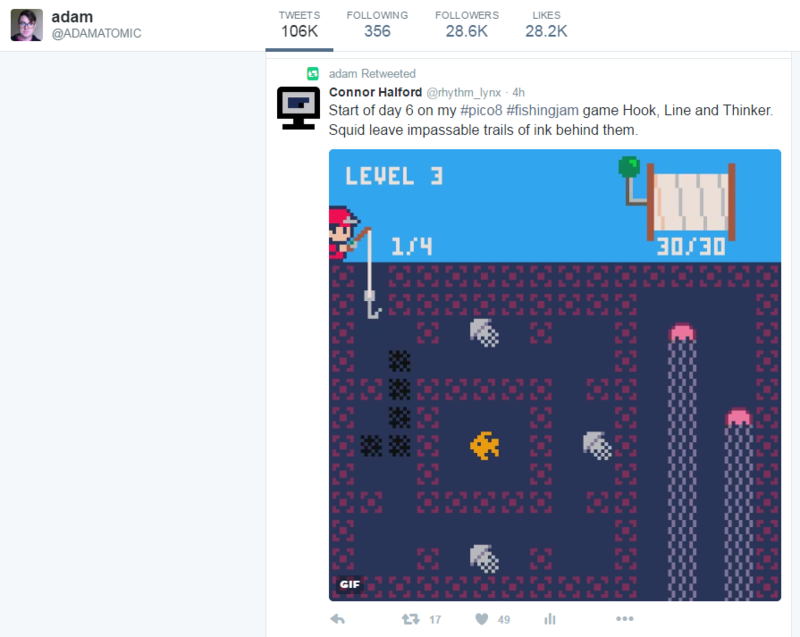 I was retweeted by Adam Saltsman and Alec Holowka, two highly respected and very well known indie devs who I greatly admire. I mean, these guys have Wikipedia pages they're so big. 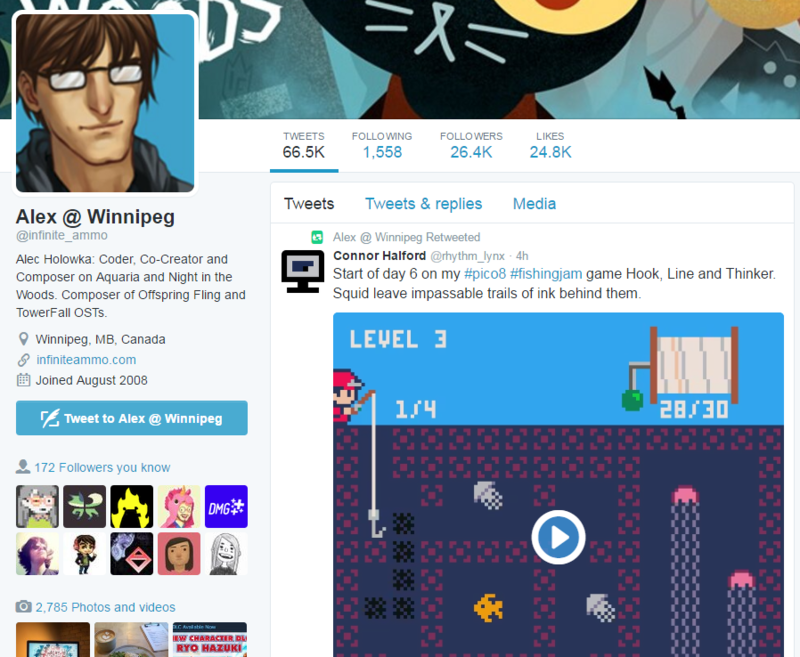 I love their games and the fact that they liked mine enough to share it with their (pretty considerable) audiences really means a lot. Then it happened again. 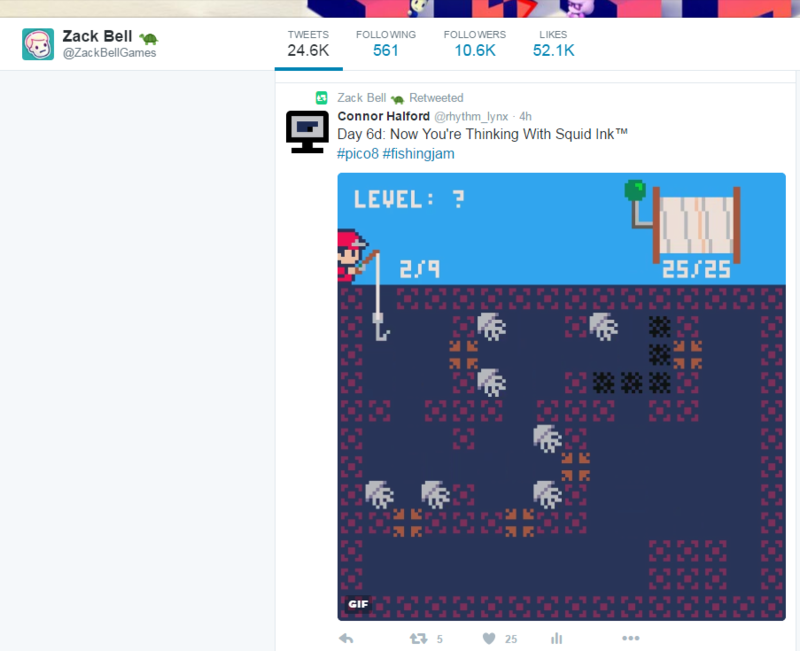 A few hours later I tweeted another gif of a more complex squid level (below) and then Zack Bell retweeted that. Mental. Over the rest of the day (when I wasn't freaking out over how many twitter notifications I was getting) I made several other levels (and tweeted a couple). I realised that I had been right when I mentioned having crabs reduce your line length after you catch them; this proved to be an extremely useful way for me to design levels where creatures have to be caught in a specific order. There's even a level that just has 5 crabs at various distances. It all ties back into that idea of everything having multiple interactions, some positive and some negative. Which is why it ended up being very difficult to create levels with squid alongside other sea creatures; the squid only have one interaction (they leave an impassable ink trail) and it's a strictly negative one (limiting movement). There's never any benefit from having caught a squid other than the fact you caught it. Because of this it is literally never the best strategy to do anything with squid until you've already caught everything else you possibly can. I really like the squid ink mechanic and the levels I created with it. But if I continue working on this game post-jam, squid are going to need something positive. There could be something that you actually want to block using ink (a shark, perhaps). Or ink could be somewhat similar to debris in that the hook can pass through it but creatures can't, meaning squid would become a way to dynamically create places where you can intentionally drop creatures after moving them. Or squid could start inking from the first square they move to, not the square they start on; this would mean that a squid could be blocking something and by moving it you clear that space, but you also block off another 5 next to it (the problem with this is that I'd probably have to redesign the existing squid puzzles). Not sure yet, but they need something, something to make it worthwhile to move a squid while there are other creatures still available. By the end of the day I had 10 puzzles of varying difficulty. I'm quite proud of them, and 10 seemed like a good number to release with. I added an in-game level select menu with live preview, which also tracks which levels you've completed (the numbers go green). Sadly I didn't have time to do actual save data, but you have full access to all the levels immediately so you don't really lose anything by leaving and coming back. That would definitely be on the post-jam todo list, as well as more levels, more mechanics, better/more graphics (I'm looking at you, fisherman), a title screen and logo, sound effects and music. It's a big todo list, but I do really like this game and the reception has been fantastic, so hopefully I'll find the motivation. This is already the biggest, best and most complete game I've made. I'd like to turn it into something even more special. I plan on continuing work and posting too ;) though I think I'll submit a WIP build before the deadline. Your game is looking really good, the color stuff is great and is one of the things I really liked about Desert Golfing once I realised it was happening. Since it's the weekend and I don't have work I was able to spend most of day 5 on this, rather than just a few hours in the evening, so I got loads done! The first thing I did was make it so that you can actually reel in the fish, crab and squid. The jelly and it's stingers can't be hooked (in fact, I added collision to the jelly body so the hook can't even pass through it - color coding, hooray!). I also set up a proper level loading system so I can design levels in PICO-8's map editor then jump to them with load_level(n), with all the collision and creatures etc. set up and ready to go. Now that my reel mechanic was fully functional it was time to move on to each creature's unique ability. The first one I did was the fish. When the fish collides with a jelly's stingers it is killed and becomes a skeleton (tricky to draw!). The skeleton can then be hooked and will cut off any stingers that it hits (including all attached stingers below the cut point). To demonstrate this I made the level shown in the gif above, which will be the first level that has both fish and jellies. I don't want to explain any of the mechanics to the player; I want to design levels which introduce each mechanic in such a way that the player naturally discovers the functionality, consequences and combinations for themselves. Part of that is about forcing the player to think. I designed the level above so that you are immediately confronted with choice. The solution plays out the same whether you take the top or bottom fish and whether you cut the top or bottom row of stingers. But because the player has to make those small choices, it forces them to actually think about the situation and therefore (hopefully) fully understand what is happening and feel clever for finding the solution. The second creature was the crab. There are now debris tiles which the hook can fit through but through which fish and squid cannot be dragged. Dragging a hard crab through them will smash the debris and open up new paths. Again, for this introductory puzzle there is only one simple solution but the player is confronted with choice. They can immediately hook the crab, but then when they try to grab the fish they'll find it won't fit through the debris. The only other possibility is to try dragging the crab through, and now the player feels smart because they discovered this mechanic on their own. Tomorrow I'll be doing the final creature; the squid will leave an impassable ink trail for the first [insert number here] moves after being hooked. The only other mechanic I had planned was that reeled-in crabs would decrease your maximum line length (claws + fishing line = bad). 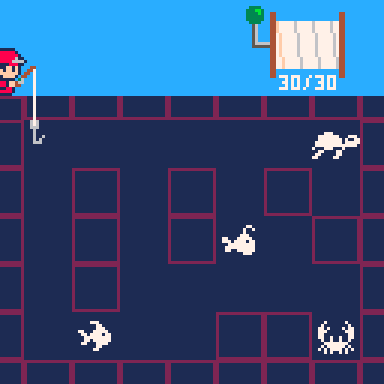 This was meant to discourage the player from starting a level and always going for crabs first to clear out pathways. It's about making them think. I'll implement this if and when I find a need for it. With those done the gameplay mechanics will all be finished and it just becomes a question of how many interesting combinations and levels I can create! I'd also like to do nice menus and a title screen. I'm very happy with the design and aesthetics on this project, so I think I'll likely continue working on it post-jam and do more levels, more pixel art, cool visual effects and add sound and music (something I don't think I'll have time for tomorrow). Fishing Jam 2 community · Replied to Cro in Have no name yet, but here's a progress thread! Looking great! It's lovely how much character you've gotten out of so few polygons. In each level you'll have to catch a certain number of creatures, which might be less than the total number since fish can be killed and jellyfish can't be caught. So I started thinking more along those lines and ended up with the plan above. I don't think I'll add any other creatures; I think there's a lot of interactions and levels I can create from these 4. Tomorrow I'll start actually getting these mechanics in and finally start designing the puzzles! Yh now that you mention it I guess I have done a fair amount in PICO-8. It's been my go-to platform since I started using it, it's just so fun and easy. And since there's only 16 colors and the sprites are so small (8x8) and resolution so low (128x128), it made the idea of doing pixel art a lot less daunting. I hadn't done any before I started using it, but I'm quite happy with the small sprites I can create now. Thanks for checking out my stuff :) Most of my PICO-8 things are on itch.io or the PICO-8 forum. There's also this twitter thread where I've put all my tweetcarts (PICO-8 programs in 140 characters or less, see this *amazing* forum thread for lots more). I really dig the aesthetic of your game Reefy Madness btw, it's really nice. Day 3! The main thing I did was being able to reel your hook back in and working out what the reel should look like with more than 10 moves available. I also made a start on the fish sprites, but it's pretty hard to fit a recognisable fish shape into an 8x8 sprite. The one above is my only success so far. I also tried playing around with 16x16 sprites and suddenly it feels huge, you can fit anything; the drawback being that it will dramatically reduce the playing area. I haven't actually tried designing any puzzles yet (note: this is bad) so it might be that 7x5 is enough, I don't know. The sea creature sprites in the mockup below are by anna anthropy, from her game octopounce. Are you planning to have the color palette slowly morph over the span of many levels, like Desert Golfing? Yesterday I did collision between the hook and the walls. Today I added collision with the line, so you can't cross your own path. Reel graphics (quite happy with them). A somewhat familiar fisherman, who may or may not stay. Thanks for the encouragement :) I really recommend trying the PICO-8, it's actually really easy to work with because everything is so straightforward (one of the many things I love about it), plus you get everything you need right in one package. So for example you can just draw a sprite right in the editor at index 7 and then render that in the middle of the screen by calling spr(7, 64, 64). It's that simple. There's lots of great stuff to learn from on the forum; you can look at the code for any game there by just clicking the word 'Code' underneath, or download the game by saving the cartridge (brilliant) and then open it in the editor and poke around the graphics, map, sound effects, music and of course code. There's also a fanzine with introductory tutorials. I first got the PICO-8 in August 2015 I think, but the first thing I made was for Ludum Dare 34 in December 2015. If you want to buy the PICO-8 it's only $15, though it might be worth buying it's big brother Voxatron for $20 instead as it comes with a free copy of PICO-8. Hope that helps! Ha, this is great! I love how quickly the fishing line gets yanked out of the water and plonked back in. Only just remembered that Fishing Jam was on, so this was Day 1 for me. I'm planning to make a puzzle game where you have to hook all the fish in the level to win and you reel them in one at a time. You have a maximum reel/line length and reeling in certain fish / sea creatures will impact the level. For example there could be a weak blockage that you can't pull fish through, but if you pull a hard crab through it the blockage will break, giving you a shortcut and allowing you to reach more of the level with your limited line. Another kind of catch could leave an impenetrable trail behind it (squid ink maybe?). So the goal is to work out which order to reel the fish in and what route to reel them over, with the additional constraints of a limited length of line and the fact that the line can't cross itself. We'll see how it goes! Thanks! I quite like this proof-of-concept, might turn it into a full thing.